A truly beautiful movie, throughout the movie you are taken through a rollercoaster of emotions. It perfectly depicts racism and how different races of people coexist with each other. The cast is also brilliant, there is no outshining acting by one person in this movie all of them did a good job. 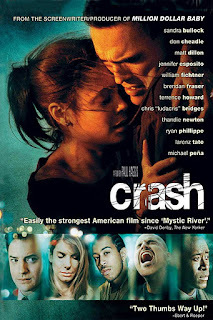 For me the second confrontation between Matt Dillon and Thandie Newton was really touching. The movie shows the human tendency “to do to others what they have done to us” and that the real world is not always so wonderful. The story revolves around Farhad (Shaun Toub) a Persian shop owner, locksmith Daniel Ruiz(Michael Peña), Det. Graham Waters (Don Cheadle), Officer John Ryan (Matt Dillon), TV director Cameron Thayer (Terrence Howard) and his wife Christine (Thandie Newton). How their lives interact and how they act in certain situation. Even though the movie shows the harsh truth about racism it also shows us that sometimes humanity prevails. All in all, it’s a great movie to watch and probably one of the most beautiful movies I’ve seen, so definitely watch it. "Even though the movie shows the harsh truth about racism it also shows us that sometimes humanity prevails"